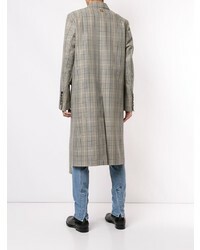 For a smart casual getup, wear a Wooyoungmi check coat from farfetch.com with black chinos — these two pieces the place of work pretty good together. Add a sportier vibe to your getup with grey athletic shoes. 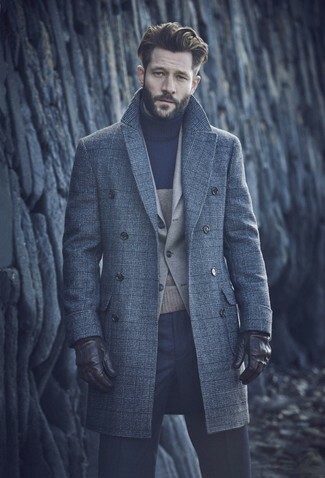 For a smart casual getup, consider teaming a grey plaid overcoat with a black turtleneck — these items fit pretty good together. 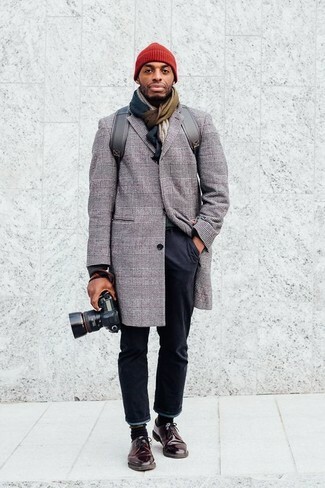 This pairing of a grey plaid overcoat and black chinos is very easy to pull together in seconds time, helping you look awesome and ready for anything without spending too much time digging through your closet. To add elegance to your outfit, finish off with dark brown leather derby shoes. 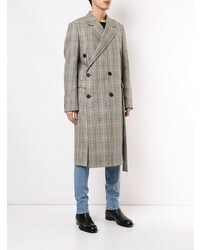 Nail that dapper look with a Wooyoungmi check coat from farfetch.com and navy check dress pants. 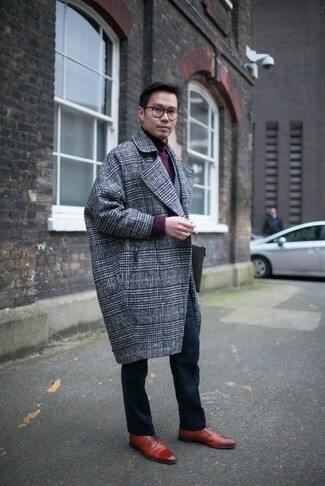 Channel your inner Ryan Gosling and go for a pair of red leather oxford shoes to class up your look. 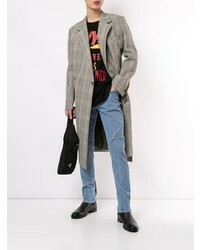 This pairing of a Wooyoungmi check coat from farfetch.com and black overalls is effortless, stylish and very easy to copy. Add a glam twist to your ensemble with black suede double monks. 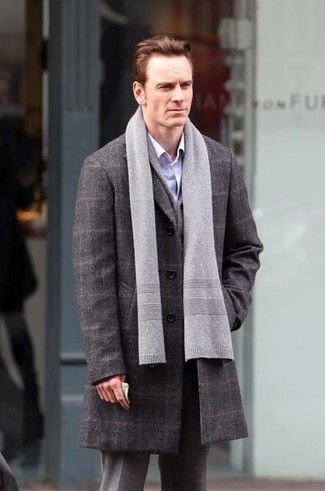 For a nothing less than incredibly stylish ensemble, pair a grey plaid overcoat with grey wool dress pants. 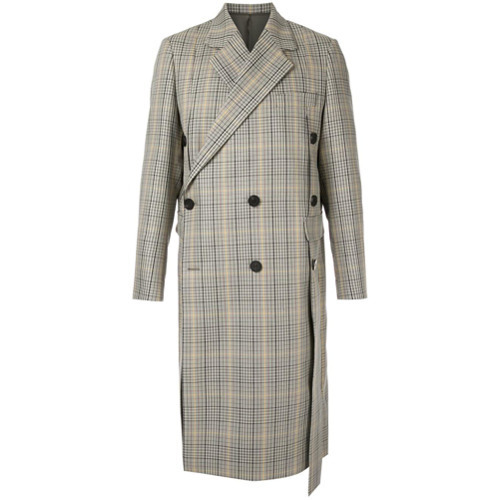 Pair a Wooyoungmi check coat from farfetch.com with a white suit for a sharp classy look. 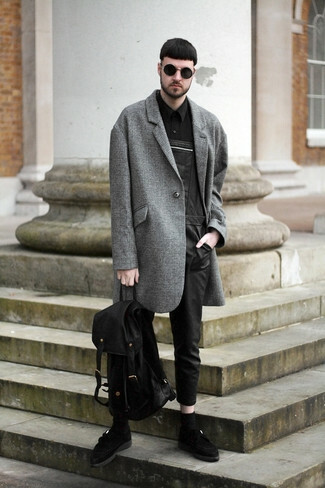 For a nothing less than incredibly stylish outfit, pair a Wooyoungmi check coat with charcoal dress pants. Opt for a pair of dark brown suede double monks for a more relaxed feel. No matter where you go over the course of the evening, you'll be stylishly prepared in a Wooyoungmi check coat and navy dress pants.